Happy holidays from Fireweed Mountain. Just a quick note to say all’s well, happy holidays to you and yours, and stay warm. A week of minus 30˚Fahrenheit weather here lately! This was from one my first afternoons out, a couple of weeks ago. Happy holidays, and all the best to everyone for the new year. 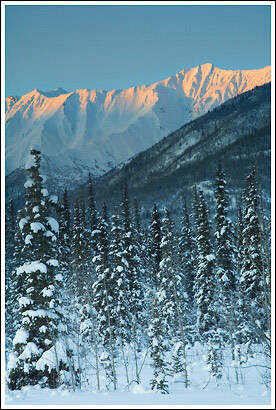 This entry was posted in Alaska, Landscapes, Winter, Wrangell - St. Elias National Park on December 23, 2008 by Carl D.
What a gorgeous view! Very well done!! Sounds like you’re in the deep freeze up there. YOU stay warm, & I’m going to be be politically incorrect & say Merry Christmas & Happy New Year!! Will be looking forward to more of your posts. Have you mastered the snowboard yet? I love the way the sunlight reflects on the mountaintop. You have mastered finding nature’s beauty with your eye and painting that beauty with your photos. I continue to admire you and your work. Hey Carl, thought you should know Keb’s was all down in the dump when you left, but it’s been minus twenty in Anchorage, Kebs doesn’t like minus twenty, and rumor has it minus forty in the hinterlands when Keb’s heard that he decided maybe going to the shack wasn’t such a good idea right now – no couch and frozen kibble, but he wishes you a happy New Year. Now me, you know I would have been there in a minute, chasing hares and causing a ruckus! Probably bring down a whole mountainside of snow. Take care! Thanks a bunch. Back atcha all, and Happy New Year.